6 Health Benefits of Grapefruit | Eat This! Named for the way the fruit hangs in bunches (like grapes), the grapefruit is a nutritious member of the citrus family. It comes from sunny Barbados and is thought to be the result of the natural cross pollenization between the orange and the Asian pomelo. Today the greatest quantity of grapefruits is produced by the United States, followed by China and South Africa. Here are 6 health benefits of grapefruit that may make you want to include it in your diet on a regular basis. Being a member of the citrus family, grapefruit is also a great source of vitamin C, the great immune system supporter. As such, it is recommended against the common cold, for many studies have indicated that vitamin C relieves the severity of cold symptoms. As a powerful antioxidant, vitamin C protects our bodies against oxidative stress caused by free radical damage and the inflammation associated with asthma and arthritis. Oxidative stress can also cause a number of other severe medical conditions, such as heart disease and stroke, and has been connected to a host of cancers, such as mouth, throat, lung, stomach and colon. Vitamin C also helps to replenish the amount of vitamin E in the body. A recent study published in the Journal of Agricultural and Food Chemistry was performed on 57 patients who had had coronary bypass surgery. 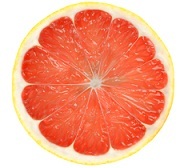 One group of participants added red grapefruit to their diet, another added blond grapefruit, and the third group didn’t add any grapefruit at all. The results showed that those who had the red grapefruit lowered their cholesterol the most and lowered their triglyceride levels, too. Both types of grapefruit lowered “bad” LDL cholesterol and total cholesterol in only a month, and dramatically more than the control group. Grapefruit contains a compound called d-limonene that prevents the formation of and dissolves renal stones. One study from the British Journal of Nutrition found that women drinking a half a liter to a liter of grapefruit juice every day lowered the pH levels of their urine, thereby decreasing the risk of developing kidney stones. However, if you are already being treated for kidney problems, grapefruit juice may impede the effectiveness of any medications you may be taking. Grapefruit is rich in antioxidants such as vitamin C, a powerful ally in the fight against free radicals that cause oxidative stress. Oxidative stress is associated with many different types of cancer. Studies have shown grapefruit juice to be effective against lung cancer by impeding an enzyme that activates cancer-causing chemicals. In colon cancer it encourages the suicide (apoptosis) of cancer cells and the production of healthy cells. A recent study found a compound in grapefruit called naringenin to be effective against prostate cancer too, as it helps repair damaged DNA in human prostate cells. Lycopene is a carotenoid that gives grapefruit its red color and another antioxidant in its arsenal. A group of phytonutrients in grapefruits called limonoids help prevent tumors by promoting an enzyme that causes the liver to expel more toxins from the body. Many studies have also shown that limonoids aid against cancers of the mouth, skin, lung, and stomach. The pulp of grapefruits contains glucarates, a type of phytochemical that has been shown effective against breast cancer. Grapefruit, which itself is fat free, contains a high number of fat-burning enzymes. Studies have shown them to alter insulin levels, thereby affecting metabolic rates. It’s not sure whether this explains how they cause weight loss, or if there’s something to them that satiates the appetite in some other way, but studies show they do work. The high amount of vitamin A in grapefruit endows it with powerful antioxidant properties to combat skin damage caused by oxidative stress. Grapefruit helps maintain adequate moisture levels in the skin, protecting it from dryness, psoriasis, acne, and wrinkles. 2 Comments on "6 Health Benefits of Grapefruit"
Grapefruits are real inexpensive in January and Febuary. I got 5 pounds for two fifty and bought 5 bags and am eating them, two a day. My sinuses have cleared some. Eating things in season is good advice. Why not eat grapefruit to lower your blood pressure instead of taking blood pressure meds? I was on three pills and it kept getting worse!